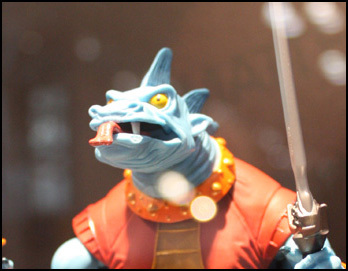 Posted by Jon in MOTUC, News with 0 comments. You heard that correctly, March will be the first date you can get your hands on Strobo the travelling convention exclusive for Masters of the Universe Classics this year. Strobo will only be available to subscription holders through the “Early Access” program. Apparently the next time Strobo will be available will be at Power Con, which is months away. They play the old “well there MAY not be any left by then” card, but I’m sure there will. Fang Man will only be shipped to subscribers. There will be no day-of stock for sale. They leave the mention of day-of stock vague in their news post so I imagine they are just holding back stock that will go for sale at another date. But then again Matty held thousands of Gygors at one point so anything is possible. Maybe next year we will come upon a Walmart endcap full of Fang Men. Anyway if you are a subscriber, congratulation you will get Fang Man, King He-Man, and Strobo if you wish to buy him. If you aren’t a subscriber and want MOTUC figures, make a few friends quick.